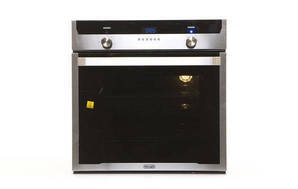 Snapshot: The DeLonghi DEL607M single oven has catalytic liners. But how did it perform in our test kitchen? Catalytic liners on side walls and back provide good coverage. Grill tray and oven shelves move out loosely and can accidently be pulled out (even though they have stoppers). Grill element can’t be lowered for cleaning. Poor visibility through oven door. Relatively small useable internal volume. Small safety shield on grill element but element is still exposed.